1) In the improvement and development of football skills. 2) To teach and promote physical, mental and moral development. 3) To teach a sense of fair and honest competition. 4) To promote fair play at all levels resulting in good sportsmanship. 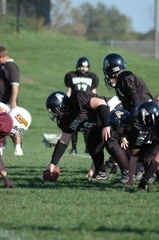 We believe organized football is more than the footballs, helmets, shoulder pads and uniforms. Our organization wants to avail to our children the opportunity to learn the aspects of teamwork, the virtues of character, courage, loyalty, and the respect for authority. In addition, we strive to promote self-discipline that enables our youth to lead our nation tomorrow. Our organization is made up entirely of volunteers, many of whom work year round to execute the necessary tasks in the interest of our players. to feel like an important and contributing part of the team. 5) To encourage, aid and support acquisition of facilities and means for the playing of football. • Improve and add to our existing football fields and facilities. • Explore new avenues to reduce cost to our participants.